At Sony’s E3 2013 Press Conference, the indie game Transistor, by Supergiant Games, has been announced for the Playstation 4. This particular title is an action game with heavy emphasis on stylized art and a hint of minimalism. The game is by the same developers who worked on the critically-acclaimed action-RPG Bastion, which is available on iOS, Mac, Linux, OnLive, Steam, Xbox 360, and Google Chrome. 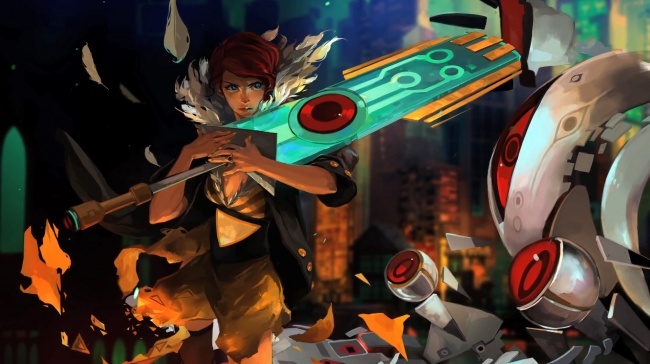 From what is shown, Transistor involves a female protagonist who ventures around a urban cyberpunk setting with a mysterious sword, whilst thwarting robotic enemies and traversing around a beautifully drawn world. The gameplay appears to function as both a side-scroller and a top-down action game. When the player is traveling at the rooftops, the game has a top-down perspective; but when the player is running through bridges, the game is now a 2D-sidescroller. As a whole, Transistor looks like well-animated game, and it appears to play very smoothly from both its separate gameplay perspectives. Transistor will be available on the Playstation 4’s launch window, and will be released along with a handful of other indie-titles that will be released at the same time. This looks like an exciting game that fans of art-heavy titles like myself, and fans of Bastion will not want to miss.